Hypoglycemia (also called as "HYPO") is fall in blood glucose (< 50mg %). Symptoms can also appear if fall in blood glucose is rapid/sudden (e.g. 300mg% to 150mg %) despite of the fact that blood glucose levels are nearly normal. It is generally due to a mismatch between diet, exercise and medicines i.e. Skipping or Delaying a meal, Excessive exercise, Overdose of medication (esp. Sulphonylurea or Insulin) or Consumption of too much of alcohol. Consult your Diabetologist to find the lowest safe blood glucose levels for your body. These levels vary from patient to patient depending upon age, medical condition and ability to judge hypoglycemic symptoms. Q. What is the Treatment for Hypoglycemia? What are the TIPS to avoid Hypoglycemia? Always carry a Diabetes Id Card with you. Frequently monitor your blood glucose and learn to recognize the symptoms of Hypoglycemia. 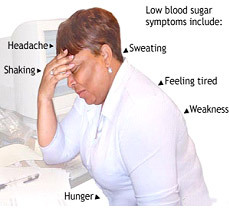 Learn to recognize the situations that may precipitate hypoglycemia. 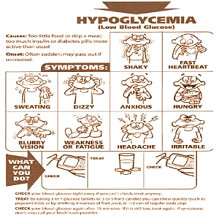 Always act immediately even if you doubt of having hypoglycemia rather than wait and watch. Take the advice of your Diabetologist regarding the treatment of Hypoglycemia and tell your friends, relatives and teachers about this. 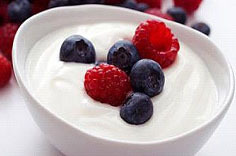 Reduce the dose of your medicines if you are sick and not able to take adequate diet. Reduce the dose before participating for any sports. 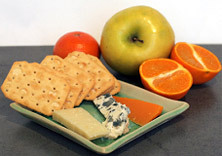 Always eat a small snack & reduce the dose before participating for any sports. Always try to find out the reason for your hypoglycemia and discuss with your doctor. Always double-check the dose and the type of Insulin & Insulin syringe. Always carry glucose powder, tablets or candies to be used in the event of HYPO (Hypoglycemia). If your meal is getting delayed then try to compensate it with fruit juice. Low Blood Glucose can result in Unconsciousness and even Death if not treated immediately"